To understand how Mini-ITX happened, we could look as far back as June 30 1999, when VIA bought Cyrix from National Semiconductor for about $175 million, two years after National had paid more than $500 million in stock for it. National had purchased the technology to be a player in the potentially emerging "network computer" market, but this hadn't happened as they expected. 5 weeks later, VIA consolidated their purchase with the acquisition of Centaur from Integrated Device Technology Inc, who were losing millions of dollars a month to their microprocessor design subsidiary. VIA was a supplier of core logic chipsets and only had a limited technology licensing agreement with Intel, which Intel had recently revoked. National Semiconductor however had settled a long lawsuit with Intel the previous year, and had in the process extended a 1976 agreement allowing it to manufacture Intel clones. Although their primary short-term aim may have been to skirt around Intel restrictions and produce their Intel-compatible 133 MHz SDRAM based chipsets, VIA's purchases also gave it the ability to remove Intel from the equation altogether and produce a low power consumption Celeron clone using Cyrix and Centaur technology. VIA initially decided to produce the successor to the Cyrix MII, codenamed "Joshua", whilst the Centaur team worked on the successor to that, their WinChip 4 core based "Samuel" technology. Samuel was internally called the "C5". After many delays, the Joshua project was shelved and the ahead of schedule 500/533MHz Samuel ("C5A") was renamed and released as the Cyrix III in June 2000. 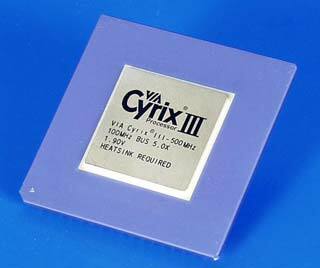 The Cyrix III was (and still is) targetted as a low-cost mass-market x86 processor, and had the benefit of low power consumption due to a simple microarchitecture. By 2001, the Samuel II ("C5B") was released, this time just as the VIA C3. Samuel II ran at a higher clock speed and added a Level-2 cache, but required a lower 1.6V voltage and was available in an Enhanced Ball Grid Array version. EBGA allowed the CPU to be mounted directly onto a motherboard without using Intel's costly Socket 370. The next version C3 (internal name "C5C") was the "Ezra" running at 1.35V and designed to run at 800-1000MHz. The Ezra-T ("C5M") was to follow that, adding PIII-Tualatin socket compatibility. The C5N Ezra-T C3 added a 0.13 micron copper process and faster transistors. 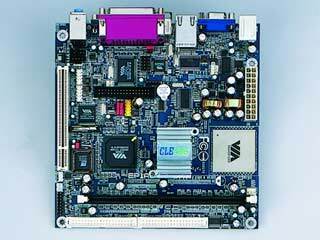 In March 2001, CeBIT 2001 saw the release of VIA's "ITX" motherboard reference design. The 215mm x 191mm VT6009 ITX Reference Board was demonstrated in "Information PC" and Set Top Box form factors, and was designed by Robert Kuo, VIA's chief R&D expert. He would later go on to design the Mini-ITX form factor. The VT6009 had a Socket 370 to support both VIA and Intel processors and used VIA's Apollo PLE133 chipset. It had TV-Output through an S-Video or RCA / S/PDIF socket, Motion Compensation for DVD playback, two IDE connectors, no Floppy connector, 2 USB ports, Firewire, one PCI slot, audio ports, and an optional RJ45 Ethernet connector through an ACR slot. The ITX form factor was never taken up by manufacturers, who instead produced smaller boards based on the very similar 229mm x 191mm FlexATX form factor. 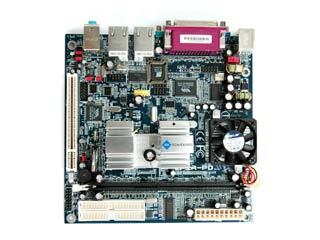 One such manufacturer was Shuttle, who in April 2001 released their FV24 motherboard, utilising VIA's PL133 chipset. 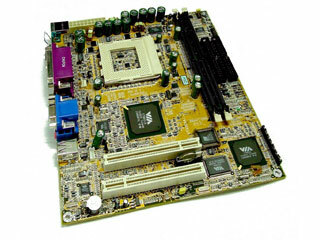 In October 2001, VIA announced a new motherboard division, to provide standardised infrastructure for lower-cost PC form factors and focus on "embedded" devices. In the same month, Shuttle announced the SV24 - a barebones system incorporating their VIA/Intel CPU compatible FV24 motherboard into a small cube-like aluminium enclosure. In November 2001, VIA tried again and released the smaller 170mm x 170mm VT6010 "Mini-ITX" Form Factor Mainboard Reference Design. The reference design introduced a new fanless variation of the Samuel II / Ezra, the "Eden ESP" processor architecture, and once again it was touted as the Information PC - an low cost entry level x86 computing platform or the "Information Station" - a small, silent PC capable of surfing the web and playing DVDs on a television. After very positive responses at CeBIT 2002, on the 3rd April 2002 VIA introduced their "EPIA Mini-ITX Mainboards" featuring a choice of the VIA Eden ESP processor for fanless applications, or the C3 E-Series (Ezra) processor for more multimedia rich applications. The EPIA 5000 (fanless 533MHz Eden processor) and EPIA 800 (800MHz C3) motherboards were almost identical to the highly integrated VT6010 reference design. Due to their heritage, both had the advantage of low noise and power consumption. By mid 2002, Shuttle had stuck with the FlexATX form factor but moved away from VIA chipsets. Where VIA had stuck with their Low Power, Low Cost, Low Noise approach, Shuttle sacrificed low noise for power and tried to fit fully featured AMD or Intel desktops into FlexATX cubes. Their SiS chipset based SS51 was their first system to feature an AGP slot, and they were already eyeing up NVidia's NForce architecture. Mini-ITX grew in popularity, and VIA realised more power was needed to improve media playback. 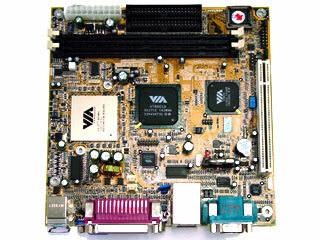 December 2002 saw the release of the EPIA "M" series of Mini-ITX motherboards, featuring improved MPEG2 decoding support from the Apollo CLE266 chipset, and adding 5.1 audio, USB 2.0, Firewire and Floppy support to the standard EPIA features. 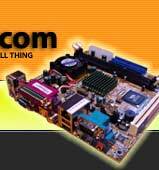 The EPIA M range consisted of the EPIA ME6000 (fanless 600MHz Eden) and EPIA M9000 motherboards (933 MHz Ezra-T C3). The line was later widened with variations on the "Classic" EPIA design, the EPIA V featuring floppy controllers - the EPIA VE5000 and EPIA VE8000. VIA's roadmap in 2002 was to have seen the C5X "Nehemiah" C3 debuting at 1.2GHz (VIA originally considered calling it the C4). The Nehemiah (C5X) was to use a new microarchitecture with more pipeline stages, and a completely reworked full speed floating point unit, 256K L2 cache and two MMX and SSE units. The next generation C5Y "Esther" CPU was to take the C3 to 2GHz. Both these CPUs were to have lower power C5XL and C5YL versions, and then to be followed in 2003-4 by a completely new VIA processor, codenamed C5Z or CZA - a 0.1 micron Pentium 4 clone. However, these releases did not happen to schedule and the Nehemiah was delayed - eventually arriving in 2003, with slightly different specifications - the C5XL / C5Y / C5YL / C5Z CPU roadmap presumably following after that. The EPIA M10000 was originally intended to be the first C3 Nehemiah based EPIA, but was originally released as an Ezra-T board. After a few months, the Nehemiah version of the M10000 arrived, and went on to become an extremely popular Mini-ITX board indeed, due to its multimedia features, small size and relatively small power consumption. At CeBIT in March 2003, VIA also added a couple of new products to their roadmap - the "Mark" platform combined a Nehemiah C3 with a supporting CLE266 chipset in a smaller single package. "Nano-ITX" was a new 12 x 12cm embedded platform proposed by VIA, originally intended to utilise Mark, though the CPU was broken out into a separate "nanoBGA" package on subsequent design iterations - becoming the much anticipated "EPIA N". VIA didn't intend to replace the Mini-ITX platform however, and EPIA M development continued - the EPIA MII was also shown at CeBIT 2003, reaching the market towards the end of the year. The MII was an EPIA M with the addition of a combined Cardbus and Compact Flash Reader on a daughterboard positioned above the board. The EPIA MII 6000 and MII 10000 eventually arrived in January 2004. The EPIA range was expanded with the addition of the EPIA CL, a Mini-ITX board designed for networking applications - with a CLE266 chipset, 2 x 10/100 LAN sockets and 4 x USB 2.0 ports the (1Ghz C3) EPIA CL 10000 and (fanless 600Mhz Eden) EPIA CLE 6000 filled a useful niche in the market, arriving in September 2003. The next board to be announced was the EPIA TC, the first Mini-ITX with an on-board 12V DC-DC Converter, normally a separate component provided inside Mini-ITX cases together with an external AC power adapter. Having the DC-DC converter on the board was great for system builders wanting to save space, and tempting for anyone wanting to put a PC inside their vehicle - though a vehicle 12V supply is far from constant, so a voltage regulator would still be required. The EPIA TC was also the first Mini-ITX board with an SODIMM socket on the reverse of the board to save space, as will be found on the EPIA N boards (Nano-ITX) on their eventual release. The EPIA TC 6000 and TC 10000 arrived on the market in April 2004, around the same time as the EPIA MII 12000 reviewed here, and the EPIA PD - a Mini-ITX board based on the EPIA CL, designed specifically for the Point of Sale (POS) market.